Sound "The Nagra CDP is a thoroughly modern digital source. At no point does it make concessions to analog by sweetening or warming up the matter-of-fact nature of digital playback, and at the same time it improves on a few of digital's traditional strengths. Above all, the CDP illuminates everything on a recording -- instrumental lines and voices, the space in which they exist, any tape hiss present, everything." Features "The CDP is actually a two-box CD player. Its separate ACPS-II power supply provides 12V DC to nine discrete power supplies. The ACPS-II houses the transformer and regulator along with 'smoothing circuits,' and it connects via a removable umbilical." The CDP is "balanced from the transport to the DAC -- a Burr-Brown 24-bit/192kHz number -- then single ended to the discrete gain sections. The CDP eschews upsampling in favor of conventional 8x oversampling."
. With the CDP I found that I preferred the single-ended outputs to the balanced (at matched levels, of course), which didn't sound quite as transparent." Value "The Nagra CDP sure isn't cheap, but nothing made so fine is." "Swiss Made." Nagra proudly proclaims this about its professional and consumer audio products, capitalizing on the notion that Swiss ingenuity and workmanship are second to none. Who am I to disagree? I would drive a Leblanc Mirabeau if I could afford it, wear a Swiss watch if I had the need to, and will take all of the Swiss chocolate anyone cares to send. When you look closely at the Nagra CDP ($13,495 USD), you see the outward signs of that Swiss craftsmanship: precision fit, luxury finish, and extreme attention to all details. The CDP is Nagra's first CD player, but not the company's only product for playing CDs. The CDT ($12,495) is the transport-only version of the CDP, and it's fully upgradeable to a CDP. The CDC ($14,995) is a CDP with preamp functionality. All use the same 12 1/4"W x 3"H x 10"D chassis and unique transport mechanism -- a Philips CD Pro2, which is normally top-mounted. Nagra has adapted it for use with a front-mounted drawer -- the "mono-block tray," as Nagra calls it -- to which the entire mechanism is affixed. That's right -- when the drawer for any of the Nagra CD spinners opens, the entire transport mechanism comes along with it. Why go to such engineering extremes? True to its professional heritage, Nagra likes its components to be stackable, something a top-mounted mechanism wouldn't allow. So the company devised a way for the mechanism -- along with the backlit LCD display -- to slide out, allowing front loading of CDs. That's the essence of "Swiss Made." The CDP is actually a two-box CD player. Its separate ACPS-II power supply provides 12V DC to nine discrete power supplies. The ACPS-II houses the transformer and regulator along with "smoothing circuits," and it connects via a removable umbilical. Inside, the CDP is spare and tidy. It is balanced from the transport to the DAC -- a Burr-Brown 24-bit/192kHz number -- then single ended to the discrete gain sections. The CDP eschews upsampling in favor of conventional 8x oversampling, but the DAC is a bit unusual: It's a voltage-source DAC, not a current-source DAC, which is used in most other players. Nagra claims that this helps the CDP achieve exceedingly low jitter, and it makes for a simpler gain circuit. The master clock and DAC are fully shielded, and the signal path is short -- it could be no other way, given that the CDP is the size of a cigar box. The chassis parts fit with extreme precision, the silicone-damped transport mechanism gliding in and out on rails machined from aircraft-grade aluminum. A mere 2 microns of tolerance exist between the drawer and rails. LEDs illuminate when the drawer opens, making it easy to locate the disc clamp even in a pitch-black room. The pairs of RCA and XLR outputs can be mounted along the side to match the connections of a Nagra PL-L or PL-P preamp. Around back are a trio of digital outputs -- S/PDIF, TosLink and AES/EBU -- a grounding terminal, and the connector for the power-supply umbilical. On the front are open/close and on/off switches for the drawer and display respectively, the sensor for the remote control, and the controls for playback functions. Inside and out, the CDP is as clean as mountain air. The CDP has both single-ended and balanced outputs, though the latter are included for the sake of compatibility, not as the terminating point of a fully balanced circuit. Over time, I've come to appreciate the sonic effect of fully balanced digital components, where improvements can range from noticeable to transformational. Sometimes balanced outputs on an otherwise single-ended source or preamp can denote the use of a few extra components in the signal path. I don't know if that's what's happening here, but with the CDP I found that I preferred the single-ended outputs to the balanced (at matched levels, of course), which didn't sound quite as transparent. I ran the CDP into Audio Research Reference 3 and Convergent Audio Technology SL1 Ultimate Mk 2 tube preamps, and the solid-state preamp stage of the Aurum Acoustics CDP, which has been significantly upgraded. Amplifiers were Lamm ML2.1 and M1.2 Reference monoblocks, along with a pair of Atma-Sphere MA.2 Mk III OTL monoblocks. Stereo amps were a CAT JL2 Signature Mk 2 and Audio Research Reference 110. Speakers were Verity Audio Lohengrin IIs and Wilson Audio MAXX 2s. Digital products for comparison were an Audio Research Reference CD7 CD player, an Ayre Acoustics C-5xe universal player, a Zanden Audio Model 5000 Signature DAC and a Model 2000 Premium transport connected with a Zanden I2S digital cable, and the Aurum Acoustics CDP, which is a CD player as well as a preamp. Interconnects and speaker cables were from AudioQuest (Sky, William E. Low Signature, and Volcano), Crystal Cable (Ultra), or Acapella (High LaMusika). Power cords were Shunyata Research Anaconda Helix and Python Helix in both Vx and Alpha varieties, Crystal Cable Ultra, or Essential Sound Products The Essence Reference. A Shunyata Research Hydra V-Ray or an Essential Sound Products The Essence Reference power distributor cleaned the power for all of the preamps, amps and digital sources, except for the CAT electronics, which bypassed the power conditioners and made a beeline for the wall outlet. The electronics rested primarily on products from Silent Running Audio -- a Craz 4 Reference rack and Ohio Class XL Plus2 platforms. I used a pair of Harmonic Resolution Systems platforms underneath the Zanden digital separates. The CDP definitely has some operational idiosyncrasies -- things that vex reviewers who move from product to product but will become automatic for owners. First, the loading drawer opens at a crawl -- perhaps because it's lugging the entire drive mechanism with it -- and you pretty much have to be within ten feet to read the LCD display. You also have to make sure the rotary switch on the front of the CDP is set to R before the remote control will operate the player, and direct track access requires pressing the NUM key first. One nicety that most CD players using the top-loading Philips mechanism omit is a sensor for the clamp that holds the CD down. Forget that magnetic puck and your CD player sounds like a blender as the disc rattles around inside. The CDP won't play unless the clamp is in place. Another feature of the CDP is its adjustable output voltage. You can move a jumper inside and choose between 1V and 3V output. DACs and CD players with a low 1V output exist, but there aren't many of them. I suspect that most people will want the 3V output, so they have some portion of their volume control's range left when they want to crank the music. I listened with both, and while I didn't prefer one sonically, I settled on the 3V output. The CD is now a quarter-century old, but for almost the first two decades of its existence it was measured sonically by the format it replaced: the LP. There was just cause for this. The stridency and hardness of much early digital sound was the antithesis of the easy resolution of analog playback. But things have changed, and digital playback is now considered mature enough to have a sound of its own, and one that most audiophiles can appreciate, even if analog remains the standard for some of them. The Nagra CDP is a thoroughly modern digital source. At no point does it make concessions to analog by sweetening or warming up the matter-of-fact nature of digital playback, and at the same time it improves on a few of digital's traditional strengths. Above all, the CDP illuminates everything on a recording -- instrumental lines and voices, the space in which they exist, any tape hiss present, everything. There's no trying-to-sound-like-analog softness or veiling; instead, the precision with which the CDP was designed and built carries through to its sonic performance, its tremendous resolving power shedding light on every musical detail in the pits of your CDs. If the sweep of an orchestra's or small ensemble's presence within the venue it was recorded makes your pulse race, the CDP will be like a shot of adrenaline straight to your heart. Well-recorded symphonies swell to fill the halls in which they were captured, and acoustic jazz reveals its more intimate surroundings. In this respect -- the ability to merge the music with the circumstances of its recording -- the Nagra CDP has no close peer in my experience. Some of the most detailed CD players can get all of the harmonic cues right but miss the unique spatial signature that the CDP digs out with ease. With most components I review, I will listen initially to recordings that have been in heavy use, as they are fresh in my mind and allow me to get an idea of what a product is doing. With the CDP, I pulled out long-unheard recordings made at the Village Vanguard just to hear if I could discern similarities among them. Taking this a step further, I grabbed Warren Zevon's Learning to Flinch [Giant 24493], a live album stitched together of solo performances. I was in the fourth row for one of them, and the sound, revisited when I listen to the CD, is still vivid in my memory. The CDP not only conveyed the blaring edge of Zevon's 12-string guitar, but it also portrayed the way the amplified music cut into the theater where I caught the show. Other CD players have sorted all of this out very well, but not with the exactness of the Nagra CDP. Oh, and the Village Vanguard sounded like it should -- neither lively nor dead, but agile and intimate. Transients blasted through the air with the CDP, not because they seemed to have mass behind them but rather because of the whip-crack speed of the player itself. In my review of the Verity Audio Lohengrin II speakers, I mentioned guitarist Jacob Young's Evening Falls [ECM 1876], the sort of moody, atmospheric Scandinavian jazz for which ECM is famous. This is a rather unconventional jazz quintet, featuring guitar, trumpet, bass clarinet, double bass and drums. Matthias Eick's trumpet is practically a percussion instrument, with bursts that act as punctuation for the rest of the music. The CDP's openness served this recording very well -- I bet I listened to it a dozen times with the CDP, even though I've owned it for only a couple of months. In fact, I listened to a large number of ECM CDs on the CDP, thinking early on that they sounded especially great and then realizing the reason why: ECM's house sound is in many ways exactly the sound of the CDP too. The soundstage is big and reverberant, with a slight dryness that enhances the sense of nearly endless space. The sound of the musicians entangles like smoke, trailing off in ever-more-fine wisps to nothingness. This is serious music, and the CDP imparts the musicians' earnestness, separating all of the instrumental lines and dividing them from the tremendous space that surrounds them. There is a tradeoff to this sort of presentation, of course. All of this comes at the price of vibrant tonal color, solidity and heft, and voluptuousness. The CDP's sound is consistently light, as in "filled with light" and "the opposite of weighty." In digital's early days, this would have also meant "bright," but the CDP's high frequencies are too deft and finely drawn to topple into such clumsiness. It is true that the mids don't have the fleshy warmth of tubes, and the bass, while certainly not deficient, won't be flapping anyone's pant leg. But, with unamplified music of all kinds, the CDP will take you right into the recording -- right into the recording venue itself. Just don't expect it to conjure full, rounded holographs of musicians in your listening room. The difference in price between the Nagra CDP and Audio Research Reference CD7 ($8995) could buy you a very good CD player. Still, as flagship models from two well-known makers, they compete for the attention of audiophiles, and I doubt the price difference would faze a buyer looking in the five-figure range. They both use the Philips CD Pro2 mechanism, and they both have single-ended and balanced outputs, although the CD7 is fully balanced from its laser to its XLR outputs. Heck, even the latitude of ARC's home in Minneapolis, Minnesota and Nagra's Cheseaux, Switzerland headquarters is similar, so the two players are practically related. Well, not really. 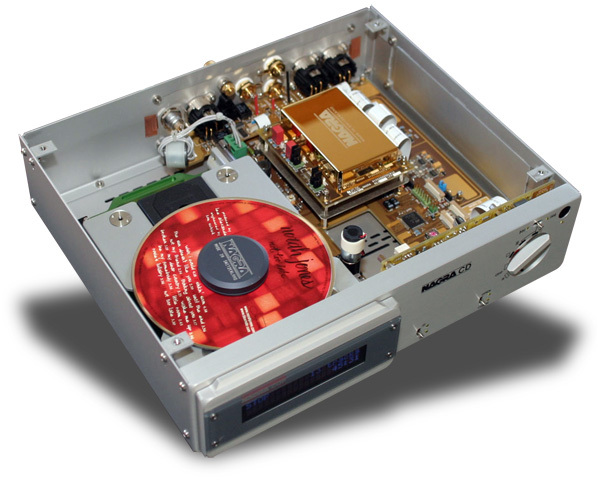 The Reference CD7 is roughly twice the size of the CDP and it uses tubes -- seven 6H30s -- borrowing the output stage of Audio Research's Reference 3 preamp. In many ways, the sonic differences between the CDP and Reference CD7 come down to the traditional differences between tube and solid-state electronics. The CD7 is all about physicality and in-the-listening-room presence. Like a high-quality analog front-end, it fleshes out musicians and singers in an obvious way. You can hear this throughout the musical spectrum -- from the mids, which have the sort of presence that audiophiles adore, to the bass, which has tubey weight and bloom. The CDP, in contrast, floats images amidst a highly illuminated soundstage in which you can practically see the air molecules. The CD7's soundstage, like that of all Audio Research Reference products I've heard, is huge in all dimensions, but it lacks the arid crispness the CDP conjures. I've commented on how the sound of the Nagra CDP resembles that of ECM recordings. Well, the Audio Research Reference CD7, then, is the sonic manifestation of Telarc -- big and palpable, more about weight and presence than air, speed and precision. If the Nagra CDP represents the science of CD playback, then the Audio Research Reference CD7 represents the art. I can't imagine a listener will fall in love with the sound of one of these players and then jilt it for the other. Nagra certainly took its time entering the digital arena, and the CDP shows the signs of that slow, careful approach. It's a unique CD player in terms of its design, build and features. Of course, that uniqueness is meaningless if its sound doesn't hold up, especially given the CDP's price, but I've not heard a CD player that captures recorded space in quite the same way, presenting an authentic soundstage, one that conveys the circumstances of the recording to a singular degree. As a result, the CDP is especially kind to acoustic music, where its retrieval of all kinds of minute musical detail can really shine. I doubt that listeners who prize the copious warmth of tubes will find a life partner in the CDP -- if such a thing even exists among fickle audiophiles -- but those who seek a less adorned, truly honest CD player will. The Nagra CDP sure isn't cheap, but nothing made so fine is. It has the heirloom quality of a Swiss watch and the appeal of a dish of Swiss chocolate.